(Kim and Craig, 1993). Mean S15Natm and 818Ovsmow of N2O in the troposphere are 6.72 ± 0.12 per mil and 44.62 ± 0.21 per mil, respectively (Kaiser et al, 2003). The isotopic composition of oceanic N2O is determined by its atmospheric imprint, the isotopic signals of biological sources and sinks, and mixing processes within the ocean. 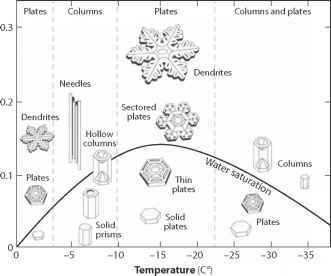 This, in turn, implies that there are characteristic signals of enrichment or depletion (so-called fractionation), which can be attributed to different biological processes as well as physical processes. The isotopic signature of biologically derived N2O depends on the isotopic composition of the substrates such as NO3- (denitrification) and NH4+ (nitrification) and the isotopic depletion/enrichment during these processes. An overview of the isotopic depletion/enrichment of N2O from culture experiments is shown in Figure 3.6. 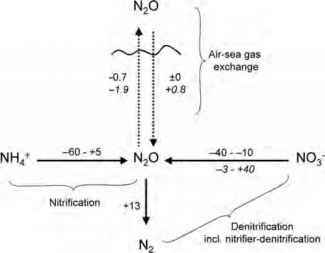 It is obvious that the range of the resulting nitrogen depletion in N2O during denitrification and nitrification is similar. The isotopic signal of oxygen in N2O produced during nitrification is introduced by the 818O value of both dissolved O2 and H2O (Ostrom et al, 2000). The isotopic signal resulting from air-sea exchange is small compared to the biological processes; therefore, biological N2O formation should yield a clear isotopic signature in oceanic N2O. However, the identification of nitrification or denitrification as N2O-producing processes strongly depends on the knowledge of the isotopic signatures of the substrates, which can vary temporarily and spatially. A detailed overview of studies of the isotopic signature of oceanic N2O is given in Bange (2008). The main results of actual N2O isotopic studies are summarized in the following sections. Repeated measurements of N2O depth profiles at the Hawaii ocean time series station ALOHA in the subtropical North Pacific Ocean revealed that 815N and 818O of N2O were in equilibrium with tropospheric N2O at the ocean surface and steadily decreased from the ocean surface to minimum values at about 100-300m depth at the base of the euphotic zone, followed by an increase to maximum values at 800m. The depletion of both 15N and 18O was attributed to nitrification (Dore et al, 1998; Ostrom et al, 2000; Popp et al, 2002). A more detailed study at ALOHA that included measurements of 818O in dissolved O2 and H2O, revealed that N2O might be formed by two different pathways: first, by nitrification via NH2OH or NO at most depths and, second, by nitrifier-denitrification via reduction of NO2- (between 350 and 500m) (Ostrom et al, 2000). Note: Values are given in %o. Negative values depict isotopic depletion in N2O and positive values depict isotopic enrichment in N2O. Data for oxygen depletion/enrichment in N2O are given in italics. the surface layer was depleted in 15N but slightly enriched in 18O compared to tropospheric N2O (Yoshinari et al, 1997; Naqvi et al, 1998a, 1998b). N2O in the core of the oxygen minimum zone was obviously formed by denitrification, since the final reduction step to N2 should result in enriched N2O. However, the 'light' N2O found above the OMZ might be explained by a coupled nitrification-denitrification pathway where NO is formed during nitrification which is then reduced to N2O during denitrification (Yoshinari et al, 1997; Naqvi et al, 1998a, 1998b). As mentioned in the introduction, N2O is an asymmetrical molecule and therefore it is possible to distinguish so-called isotopomers according to the position of 15N within the N2O molecule (the corresponding 8 notation is given in parenthesis): 14N15NO (815Na) and 15N14NO (815Nb) (Toyoda and Yoshida, 1999). The 15N site preference (SPN2O) in N2O is given as 815Na - 815Nb. Measurements of SPN2O should allow for the identification of the mechanisms of N2O formation according to the different microbial pathways (Sutka et al, 2003, 2004). Based on the results of a study with cultures of AOB, nitrifier-denitrifiers and denitrifiers, Sutka et al (2006) concluded that the characteristic SPN2O of nitrification and denitrification (including nitrifier denitrification) are generally ~33 per mil and ~0 per mil, respectively. Thus, isotopomers might be used to distinguish between N2O produced during oxidation (nitrification) and reduction (denitrification and nitrifier-denitrification) processes, however, it seems that isotopomers cannot be used to reveal subtle differences such as that between nitrifier-denitrification and denitrification (Schmidt et al, 2004; Sutka et al, 2006). So far, the oceanic distributions of N2O isotopomers have been determined at a few stations in the North and South Pacific Oceans (Popp et al, 2002; Toyoda et al, 2002; Yamagishi et al, 2005; Charpentier et al, 2007), in the sub-oxic eastern tropical North Pacific Ocean and Gulf of California (Yamagishi et al, 2005, 2007), and in the anoxic Black Sea (Westley et al, 2006). In general, the conclusions from the SPN2O distribution are in overall agreement with the AN2O/AOU relationships and bulk isotopic signatures of N2O as described above. In the North Pacific Ocean SPN2O values of up to 35 per mil were determined, indicating that nitrification is the main N2O formation process throughout the water column (Popp et al, 2002; Toyoda et al, 2002). An additional significant contribution by nitrifier denitrification within particles was suggested for the pycnocline at 250-350m in the central South Pacific subtropical gyre because a SPN2O minimum of only 10-12 per mil was found at that depth range (Charpentier et al, 2007). In contrast, Yamagishi et al (2005) suggested a net N2O formation in the oxygen minimum zone of the western North Pacific Ocean, which mainly results from both formation and consumption during denitrification, with only a minor contribution by nitrification. SPN2O data from sub-oxic (eastern tropical North Pacific Ocean, Gulf of California) and anoxic (Black Sea) environments indicate that N2O production via nitrification and N2O production/consumption via denitrifi-cation can be coupled and might even be concurrent at the oxic to sub-oxic/anoxic interfaces (Westley et al, 2006; Yamagishi et al, 2007).